There is some exaggeration perhaps, but it was certainly tedious. Eraly is writing "popular history" for the layman, the kind of person who has not read serious history since his school days. And there are many such persons in our country today because history has long been regarded as a "useless" subject. Fortunately it is no longer that disreputable, but the number of people who are ignorant of the basics of Indian history is still shocking. For them this book will be an eye-opener. But even others should enjoy it. Admittedly, it abounds with stereotypes. The standard questions are asked, why couldn't the Indians repel even one of the invaders, and why even the Turkish/Afghan dynasts of the sultanate were unable to throw back the likes of Timur and Babur? The usual suspects are trotted out — the Indian preference for elephants over horses, the enervating climate, our fatalistic attitude, etc. We are a rather "torpid people" "sluggish in battle" and lack "the kinetic energy" of the Turks coming down from the "cool Afghan mountains." It is the old Circe syndrome, provocatively described by Nirad Chaudhary. India is like the legendary sorceress Circe: those who are seduced by her charms are turned into swine. One may also question whether Hinduism was really as effete as Eraly seems to assume. It can be argued that when Mahmud Ghazni started on his plundering career, Buddhism, rather than Hinduism, was the dominant religion in India — which was on the wane. Hinduism had just received a boost from Shankaracharya in the 9th century CE. 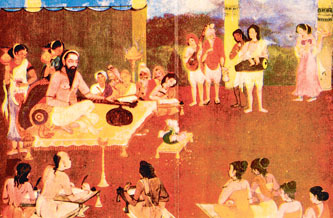 If it is argued that Shankaracharya was not as influential in the north as in the south, there was the great Shaivite philosopher Abhinavagupta in Kashmir. This is nit-picking. 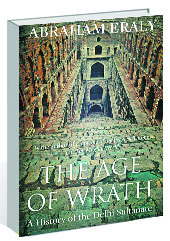 Abraham Eraly has written a highly readable book. The narrative is livened by a liberal use of memorable quotations from historians, like Shams-i-Siraj, Ziyauddin Barani, Ferishta, and their like — even though most of the quotes are in fact from Elliot and Dowson’s huge compendium of judicious selections taken from the translated works of those described by the editors as "India's Own Historians." But this again is being unfair. Eraly has succeeded in making a rather dreary period interesting. His picture of Sultan Mahmud Begarha of Gujarat with "mustachios so long that he ties them over his head as a woman would tie her tresses", and who "eats poison daily so that if a fly lighted on his hand, it swelled and died at once, and many of the women with whom he slept died from the same cause," shall linger when much else has been forgotten. We have Mubarak Shah Khalji, who appeared in the durbar "decked out in female trinkets and apparel", and made his cronies "scamper around stark naked, insulting the scandalized nobles with foul language, and defiling and befouling their garments." Many of the sultans were monsters, but Eraly has tried his best to be fair. Many of the Hindu rajas of Vijayanagar were no better. Here again we have fratricidal wars of succession and defeated princes being blinded and imprisoned. There is at least one case of a son murdering his father, and infant rajas dying suspiciously while under the protection of their regents. Interestingly, Eraly points out, religion had little to do with all this. Hindus and Muslims fought on both sides, and temples were destroyed in conflicts between Hindu princes as well. The object was merely to humiliate the opposing prince who might be the patron of that particular temple. And, loot was the greatest incentive of all. Gold knows no religion.